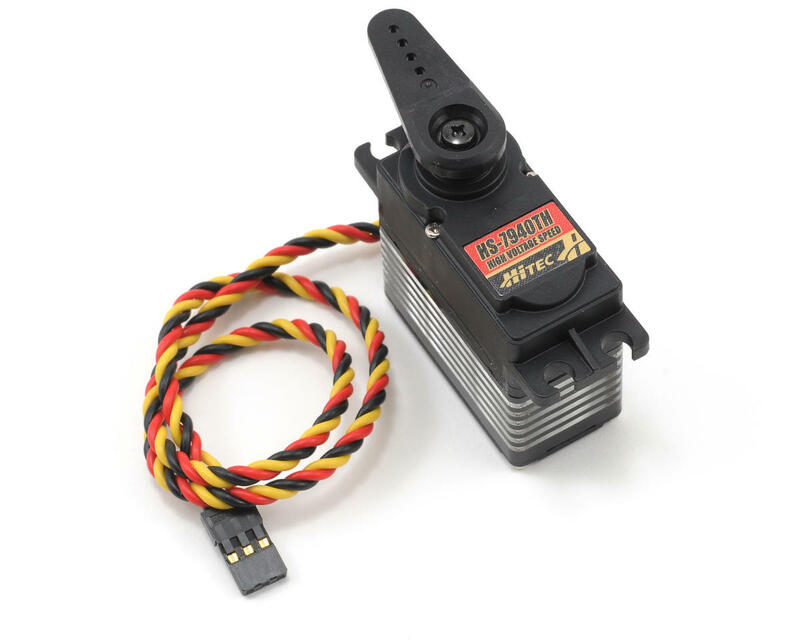 This is the Hitec HS-7940TH High-Voltage 7.4V Ultra Speed Digital Servo. Hitec's fastest standard size servo, the "Ultra Speed" HS-7940TH is designed to operate on a two cell LiPo Pack. 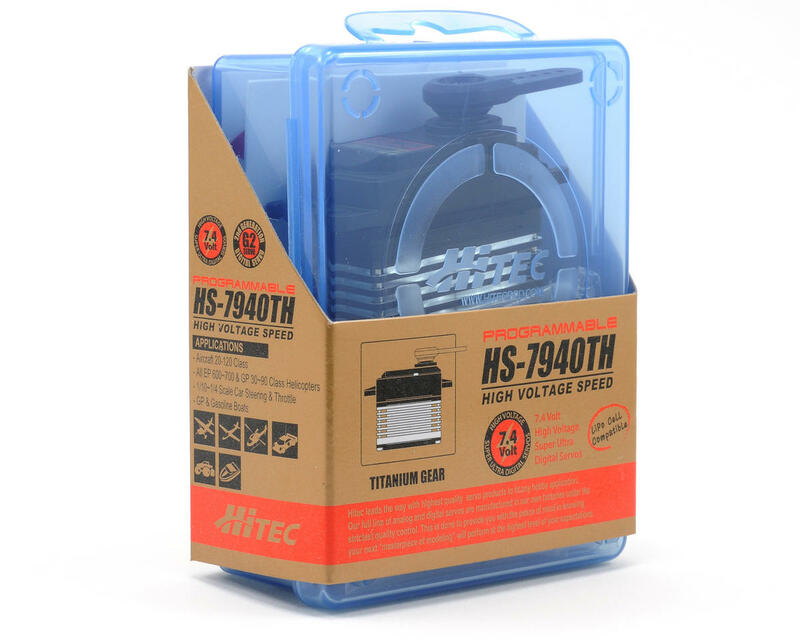 Featuring a high resolution "G2" second generation programmable digital circuit and indestructible Titanium gears, The HS-7940TH has the performance and durability you've come to expect from a Hitec servo. Other features in the HS-7040TH include a 7.4v optimized coreless motor, integrated heat sink case, and a top case with two hardened steel gear pins supported by axial brass bushing. The HS-7940TH has been designed for applications where speed and response is demanded. Perfect for High Performance Nitro and Electric Helicopters, Aircraft, Cars, and Trucks. Featuring a blistering transit time of .07sec but still maintaining a respectable 183 in/oz of torque at 6.0 volts. Increase the voltage with the use of a unregulated LiPo battery, and the specs increase to a crushing 222 in/oz of torque, with a lightning fast transit time of 0.06! All this speed and power is harnessed by incorporating the industries first Titanium gears for incredible wear resistance. AWESOME!!!!! perfect for racing! !wouldn't go with anyone else, picking up another! running in 1/10 2wd & wd buggy! oh yea it's super quick. strong and very very capable. great product and supurb customer service. no need to say more. 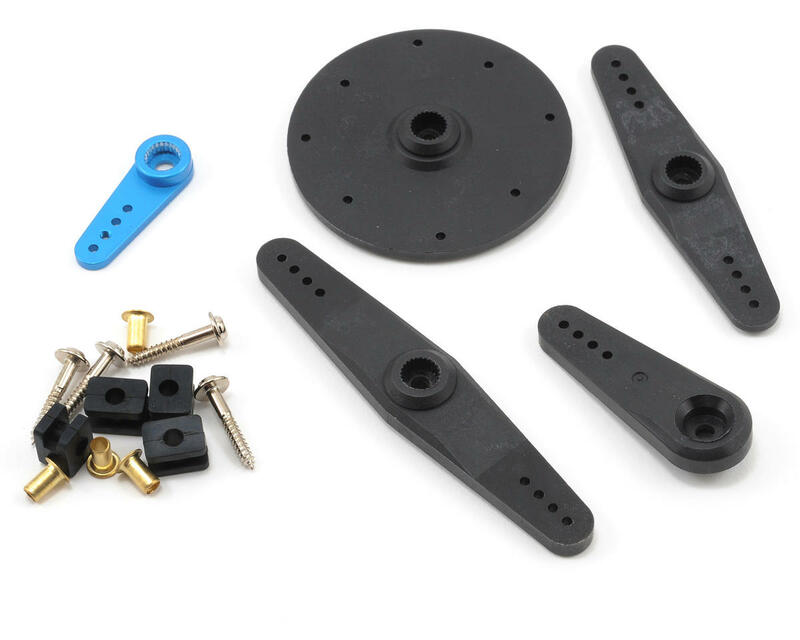 Fantastic throttle servo for 1/8 racing. I noticed a couple of reviews indicating gear problems but I'm just about positive they were installed in applications that were less than ideal for the specifications of the servo. I own 5 of these and use them for steering on my 1/10 buggy, 4wd buggy, and stadium truck. The other 2 are on throttle duties for my 1/8 buggy and truggy. Zero failures in the 4 years I've been running them and if I do have a problem, I know Hitec will take care of it's customers like nobody else in the business. I love these servos I have one in my Jammin SCRT 10 and this servo has no issues cranking those tires with a 4.5 at near full throttle. I've had this truck run off the track with a rapid stop thanks to a water pipe.. broke the lower arm and bent the dogbone but the servo didn't even hiccup. I bought another one for my AE SC10... Probably get another one for my 4wd buggy. Be sure to set those endpoints or else you will be replacing it sooner then later. This servo is everthing that you would expect a top of the line servo to be. I run this servo for buggy steering and throttle. Never slows down. Fast, Strong, reliable, very good looking! I love it!!! Awesome Servo I use this in my D8. I run an Airtronics M11X. The receiver can handle the 7.4 no need for a converter or fancy rewiring. This servo is fast with a 7.4 LiPo. I love it would recommend it to anyone. Great servo! I have had nothing but luck running this servo for throttle in a truggy. I haven't used it for steering yet but it is apparently a great buggy steering servo as well. These are a great upgrade from the 7955's. I wouldn't have believed there could be a better servo until these came about! Great product! I wouldn't use any other brand of servo! Works great for a couple months, then dies. I have heard they have a Gear issue, and Hitec will fix it with no problems, but for 150, this servo should last years not months. Bought this and a 7950th for my Husband less than a year ago. Will now be sending it back for repairs. It's a real shame to pull a dead $150 servo out only to replace it with a $99 ACE just so you can finish race day. Going to try out HITEC warranty service and see if we will continue to run them or make the switch to another brand.